In previous articles, we’ve discussed items that should never go down your kitchen sink or other drains. At the top of this list are fats, oils and greases (sometimes abbreviated as FOG). What makes these kinds of substances so bad for your plumbing? Well, in addition to being harmful for the environment (large amounts of oil and grease are very difficult for water treatment plants to remove from the water system), the main issue to worry about is the likelihood of creating very nasty clogs. Why do oils and fats cause clogs? When you rinse these fats down your sink, the oil is probably warm and in a liquid state. If you rinse with hot water, this keeps it warmer. The liquid oils travel with the water through your pipes for some distance, but eventually the temperatures cool and the oils begin to solidify. As they cool and harden, they stick to the sides of the pipes. They can aggregate with other items that shouldn’t be in your pipes—such as dental floss, “flushable” wipes, cotton balls, etc.—and create even a larger mess. Of course, it’s not just solid fats—all types of oils tend to cling to the sides of pipes. Eventually these clogs can grow to the point that they restrict the water flow or block it altogether. The even bigger problem is the clog has potentially formed in the plumbing beneath your home, in your septic tank or another hard-to-access spot that provides a real challenge for removing it. Worse than this, though, is the very real possibility that the clog can form in the neighborhood or city sewer line, causing a major sewer backup or other unpleasant results for a lot of people! Drippings from chicken, pork, beef, etc. For things like bacon grease or other fats that solidify, let them cool completely and then throw them away. Refrigeration can help speed up the process. If you’ve just sautéed something in oil, wait for the pan to cool. Wipe as much oil out with a paper towel as you can, throw the towel away, and then rinse. It’s also a good idea to wipe dishes with a paper towel after an oily meal before rinsing them in the sink. 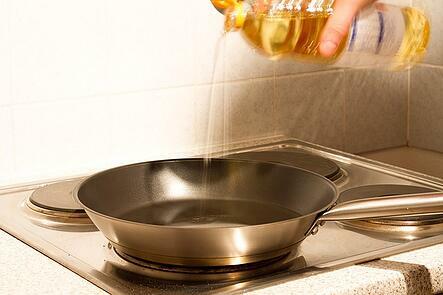 If you’re dealing with larger amounts of cooking oil, let the oil cool completely. You can then pour it into a plastic container (such as a margarine or yogurt tub), a paperboard carton (such as a milk or orange juice carton), or into a bottle with a lid, and throw it away. Just make sure the lid or cap is screwed on tightly, or you could have mess on your hands! It’s also possible to recycle cooking oil through some specialty programs. Note: Don’t throw hot oil into your trash can! It can make a big mess as it melts the bag, or even create a fire hazard. Reading this too late? If your drains are already clogged—or if you notice they’re running more slowly than they should, you may want to get a plumber involved now before things get backed up. Ken’s Plumbing is available 24/7—call us at (864) 242-5511 today.